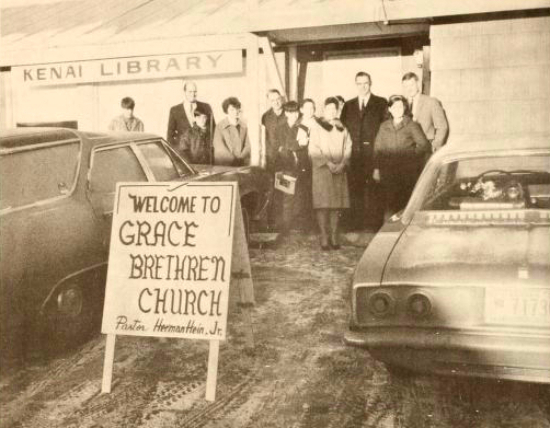 After months without a pulpit, Reverend Herman H. Hein, Jr. opened the Kenai Grace Brethren Church on January 4, 1970. Fifteen people met for morning worship in the Kenai Library. This story, by Herman H. Hein, Jr., was first published in the February 1970 edition of the Brethren Missionary Herald. In it, he shares his story of challenges and growth as he founded a Brethren Church in Kenai, Alaska. Enjoy this throwback to another era in the history of the Grace Brethren movement. During the 16 years of my ministry, the thought has often come to mind, “What is it like to be without a church, or a regular pulpit ministry?” Well, I found out. From the time of the last message at Kokomo, Indiana, to the first message in the Kenai (Alaska) Grace Brethren Church, it was exactly six months. Every Sunday morning during those six months there was an empty feeling because we could not go to our church to preach the Gospel of Jesus. It was an empty period of time. We enjoyed witnessing to others, but it isn’t the same as preaching the Word. But praise the Lord, the six months of emptiness is passed. I have a pulpit again! It is only a small homemade lectern, made during substitute teaching in a high school manual training class, but what a blessing to preach that first message after all that time! After waiting and preparing for thirteen years from the original call of God to begin this work, we look back and see how the Lord was working to bring it to pass. Let’s go back to six months ago when we enjoyed our last Sunday with the people of Kokomo. They sent us forth with thirty-five almost new songbooks, two lovely offering plates, a new guest register, their blessings, and their support. The Brethren Home Missions Council sent out a Minute-Man Appeal to pay our expenses to get us here. On arriving in Anchorage, I was employed part time as the sales and service representative for the Alaska Scale Company. On arriving in Kenai, I was sponsored by a local businessman into selling Amway Products. In September I was hired as a substitute teacher in the Kenai High School and Soldotna Junior High. These jobs, along with what my wife can earn at a part-time job with Sears Roebuck, and help of $100 a month from Brethren Home Missions to help on our lodging, we have been able to make our livelihood. The Lord began to work more outwardly. There was a great need for school teachers – so Beverly Welborn, our daughter, was promised a job teaching. It didn’t take long for Beverly and Jim, her husband, to get started on their way to Alaska. I found Jim a job in electronics before he arrived, and now both are employed. Then the Lord provided a job for Terry Appleby, and he and his family arrived on December 20. We met on December 13 and organized the Grace Brethren Church, with plans to start the first Sunday of the New Year, but there was no place to meet. Then the new Baptist work meeting in the library moved out on December 20, leaving it open for us. So January 4, 1970, arrived along with 14 people for Sunday school, 15 people for morning worship, and 13 more back for evening worship. So that is how the Lord started the Grace Brethren Church of Kenai, Alaska. Praise His Name! The six months of emptiness is over. —Rev. Herman H. Hein, Jr. served served with Grace Brethren Home Missions for many years, establishing and pastoring churches in Indiana, Ohio, Michigan, and Alaska. He passed away June 6, 2010 (find his obituary here). Read his unabridged story and browse the rest of the 1970 archives by clicking here. Read our previous throwback story here.